The Arctic Boot brought extreme cold-weather protection to the unbeatable KLIM snowmobile boot lineup. 1200 Grams of 3M™ Thinsulate™ Insulation throughout the main body, 600 Grams of 3M™ Thinsulate™ Insulation in the midsole and 300 Grams of 3M™ Thinsulate™ Insulation laminated into the removeable insole guarantee absolute warmth in all conditions. Moisture wicking liner materials, durable exterior panels and a highly-breathable substructure only start an intense list of features for this KLIM snowmobile boot. 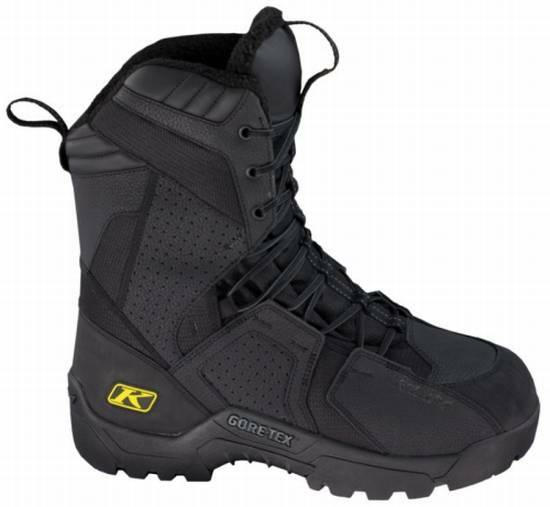 For riders wanting maximum heat retention, durable GORE-TEX® GUARANTEED TO KEEP YOU DRY® waterproof performance and solid foot and ankle support, there is no better insulated boot than the KLIM Arctic GTX boot. Haven't tried them yet, but so far they seem great! !